Completing my first half marathon was such an accomplishment. After months of training and hardwork I can finally call myself a half marathon runner. Race day was like nothing I have ever experienced– especially with a 10pm kick off! The morning of the race I went to pick up my race packet and swagga from ESPN’s Wide World of Sports with my sister- who was also running her first half marathon with me. It was fun to get the ID Tag and make sure it worked by walking over the example time marker and walking through the running expo. They had some pretty great gear that they were selling there for some amazing prices! I tried not to splurge but I did find a new running clothing line that I love: One More Mile. They have some very witty slogans on their gear- check ’em out! After getting pumped for the run it was time to head back and chill out by the pool and try to take a nap. Yeah, that was hard to do. After 2 weeks of a vacation in Orlando and going to Disney World, Universal Studios, and playing my first ever nine holes of golf– sitting down and doing nothing became hard to do when you are use to the go, go, go! lifestyle for the past 14 days. But– I tried. Doing a race on the last day of vaca is not ideal but that is just how the schedule happened- so be it! After visiting the 100’s of porta potties a few times from all of my power juice and water- it was go time! I had been placed in the last corral. Corral D because this was my first race EVER so I didn’t have a previous time to submit. I was fine with that. My goal was to finish a half marathon afterall- I wasn’t out to win it. That had to be my train of thought seeming as I just exhausted myself walking for 14 days! We gotta stay real! As I took my place with the pack, we were both dead last. Not kidding. Standing at the back of everyone. 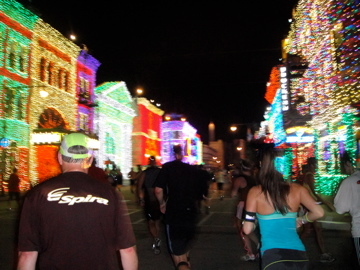 As Corral A went to run fireworks went off at the start line and the DJ’s started spinning. 15 minutes to go until I reach the start line! I was so happy and I suddenly didn’t feel tired anymore. Off we went. This is where I attached my ears to my amphipod. My head was getting tooo hot! It was a lot of running past people saying a polite, “excuse me” but I got sick of that and by passed everyone by running on the grass. Then one of the mc’s yelled in his mic, “watch out for the brunette!” I laughed. 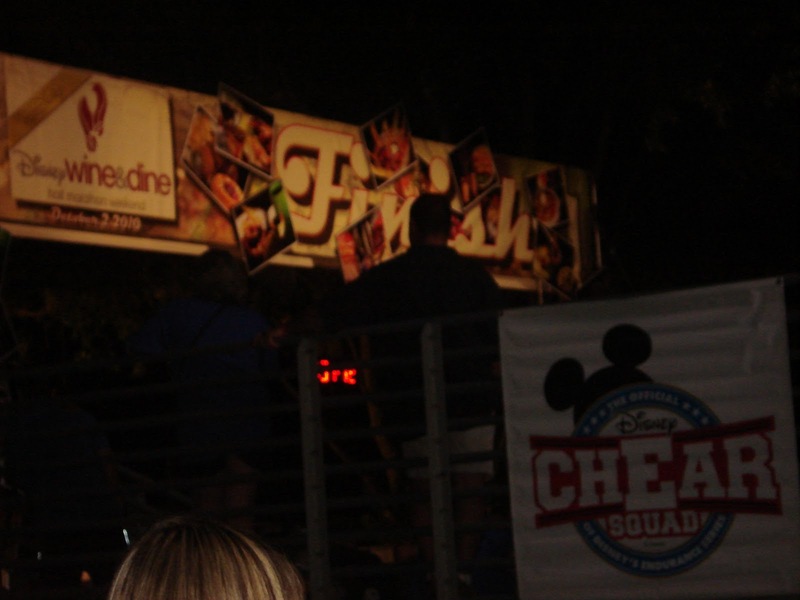 I was running past stilt walkers, disney characters, amazing live bands, and DJ’s along with Disney staff yelling “almost there! Doing great!” I did feel great. I had my ipod playing but it was so different to be running a race with a whole bunch of people and working around their pace until you could reach a nice spot where you were running at your own pace. I didn’t hit this until about 7 miles. That made my time a lot higher but as I said, I just wanted to finish! The amount of hills in Disney were incredible. I couldn’t believe how many there were! But running through a theme park made it so much fun! Until you got to a path that was very narrow and you had a whole pack iof runners trying to squeeze their way past people. It was like 4 lanes on a road going down to 1. 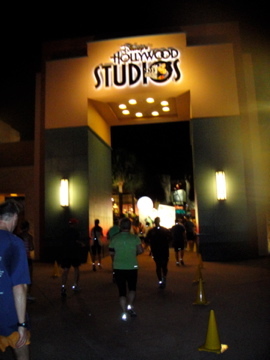 Those were not so fun parts because people tended to take these as walking breaks and I just wanted to keep my pace. But I went with the flow. I cam across Buzz Lightyear and decided I might as well take a photo op break! i mean how many times can you run past Buzz Lightyear and not have to wait in line?! It was perfect. At 8 miles I started to feel the, “omg 5.1 miles to go?! Seriously? Can I do this?” So, I popped some sport beans and I was feeling like dynamite. My energy just went from zero to hero. Amazing! I grabbed a powerade from the staff on the side lines and just kept swimming. I noticed that my ipod kept telling me that I had been running a lot farther than all of the markers. 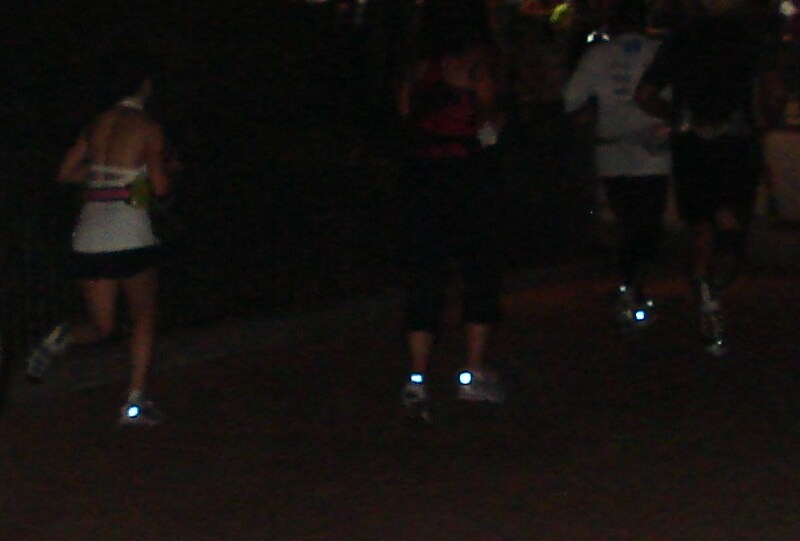 I also overheard other runners checking their garmin and saying that their devices have said they have ran farther too. So, I am really interested to know if I ran farther than 21K on that run because my time was no where near where I wanted it to be. But- I’m still happy with the outcome. Afterall, your first race sets your Personal Best (PB) so it’s only up from here! Sprinting through the finish line was great! I felt really proud of myself for completing such a huge goal! As I received my medal and food package, I was out of breath and ready to eat the food from my after race snack that was handed to me. I took one bite of my banana and did not feel so good. I was nauseous and just wanted to sit down. So I did. Then I went to the bathroom and there were a good amount of people throwing up and hugging the toilet seat and then I became one of those girls. Not so good. I tried to drink water and replenish myself and get that powerade into me but my body just could not handle it. so into the line I went to the baggage claim. After getting all of my items I threw on my start up jacket and started walking to find my fame in Epcot. We were suppose to meet somewhere in England or between France and Morocco. Too bad I couldn’t see them and walked around the world twice trying to find them while making a stop in Mexico to do a little vomit. I couldn’t believe it. never have I felt this way after running a half marathon length. I got up and kept moving and luckily my family happened to walk my way. At 3:30am we left the park. Only to wake up at 7am to leave for the airport. I woke up, still in rough shape and tried to stomach some food and lift my luggage to the car. My luggage never felt heavier. With my compression socks on I headed for our plane. At that moment, I had no desire to run a half marathon any time soon. But now- I could definitely do it again! Not after a 2 week vacation mind you but definitely on a more rested level! Overall, I had an amazing experience and I am SO glad I experienced my first half at Disney! This entry was posted in http://schemas.google.com/blogger/2008/kind#post, One More Mile, Personal Best, Playlist, Stats of the Run by Siobhan McCarthy. Bookmark the permalink.